What It’s About: The Earp brothers-Wyatt (Henry Fonda), Virgil (Tim Holt), Morgan (Ward Bond) and James (Don Garner)-stop their cattle drive to take a rest and meet Old Man Clanton (Walter Brennan) and his sons. Old Man Clanton tells the Earps that they’ll never get their cattle to California and offers to buy them at a cut-rate price; when Wyatt refuses, Clanton suggests the Earps go into nearby Tombstone to relax. The three oldest brothers leave James behind and venture into Tombstone, where they find an out of control town. When a drunk gunman interrupts Wyatt’s shave and the marshal refuses to handle the situation, Wyatt takes matters into his own hands, bringing an offer from the mayor (Roy Roberts) to be Tombstone’s new marshal. When the Earps find James dead and their cattle stolen, Wyatt changes his mind and takes the mayor up on his offer. Along with his two brothers, Earp begins to clean up the town, but trouble comes in several forms. Doc Holliday (Victor Mature), who runs gambling in the town, returns, and begins an unsteady friendship with Wyatt. The arrival of Holliday’s old flame from back East, Clementine Carter (Cathy Downs) sets in motion the events that finally bring the Clantons , Earps and Doc to their legendary gunfight at the O.K. Corral. Why Watch it Today? : The famous gunfight took place today in 1881, inspiring countless films, including Tombstone and Wyatt Earp in the 1990s Gunfight at the O.K. Corral in the 1950s, among others. 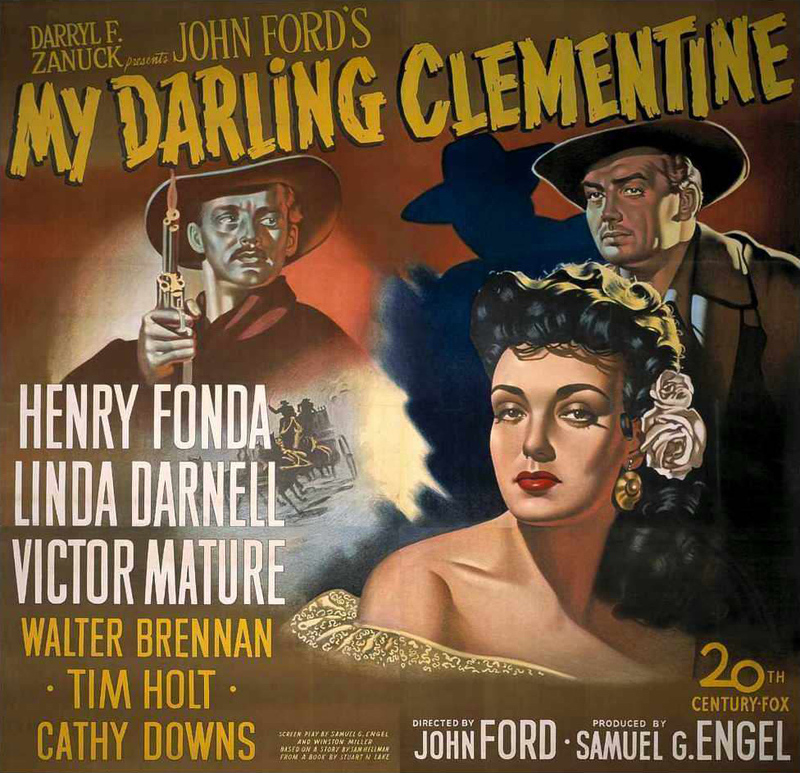 My Darling Clementine is John Ford’s version; you can read a full review here. This entry was posted in "Based on a True Story", Adaptation, Black and White, Drama, Movie of the Day, Period Film, Western and tagged 20th Century Fox, Alan Mowbray, Arizona, Cathy Downs, Cold War, dance, Darryl F. Zanuck, doctor, double cross, Grant Withers, graveyard, gunfight at the O.K. Corral, Henry Fonda, Jane Darwell, John Ford, John Ireland, Linda Darnell, rustlers, showdown, surgery, Tim Holt, Tombstone, tuberculosis, U.S. Marshall, Victor Mature, Walter Brennan, Ward Bond, Wyatt Earp.